Thank you to Desert Foothills Mountain Bike Association for the $500 donation to our program. We appreciate all of your efforts to support our effort to get more kids outside and riding bikes. DFMBA’s mission is to enhance the mountain bike experiences in the greater north Phoenix valley. DFMBA does this through trail advocacy, development, education, and maintenance, to the benefit of all trail users. As all of you probably know, New Belgium Brewing is INCREDIBLY supportive of cycling communities across the United States and their support continues with their $2000 donation to Trips for Kids Phoenix! Thank you for believing in what we do! Cheers! Trips for Kids Phoenix is a non-profit organization that values healthy lifestyles, the need to protect and appreciate our environment, and empowering youth to take personal responsibility for their lives and the communities in which they live. Our goal is to team up with local agencies to provide positive, fun outdoor experiences utilizing the challenge and joy of mountain biking along with community service and educational opportunities to reach disadvantaged youth (ages 10-17) who might not otherwise have these opportunities. Trips for Kids Phoenix works with the kids to help them gain confidence and progress with their abilities. This program is a bully-free zone and the kids organically begin to cheer one another on as the day goes on. The day mountain bike trips give the kids the opportunity to be kids and to just enjoy life. Most of them come from horrible home environments with little support or encouragement. The rides give the kids the opportunity to be cheered on by their peers and to teach the other new riders skills they have learned. “The value of educating children through outdoor experiences cannot be overstated. enhance performance all academic subjects, it provides students with vital life tools. Improvement can be seen in persistence in tasks, communication skills, working in groups and even thinking about the environment is as important as teaching them to read and write.” This is what the Sierra Club has to say about environmental education. Of course, kids have fun on a mountain bike, but we also use this opportunity to teach concepts that will be of lasting value. Environmental Education is an important part of Trips for Kids Phoenix, in addition to lessons in personal challenge and self-esteem. 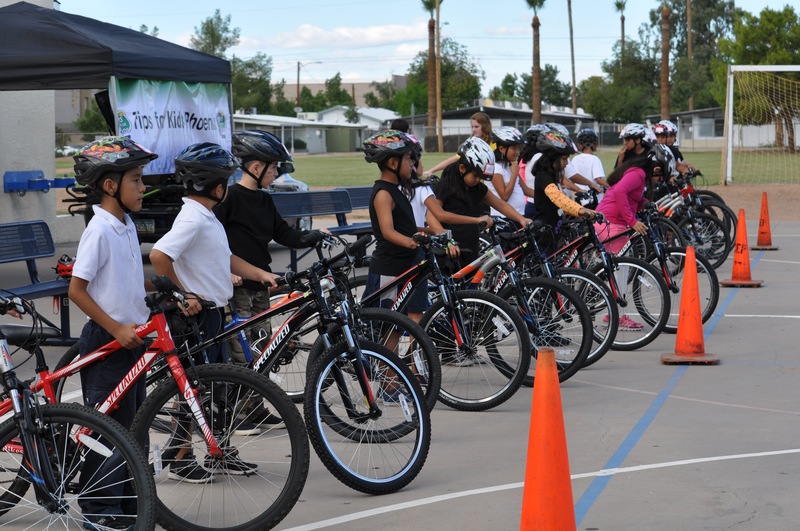 Bikes are a great opportunity to teach kids about a number of pertinent issues. Our goals are to teach: 1. Appreciation of the outdoors so that children will care for it. 2. An understanding that each person CAN make a difference within his/her environment.